We've been around the block a few times on our journey to create an exceptionally easy drinking, light beer for all to enjoy any time of year. 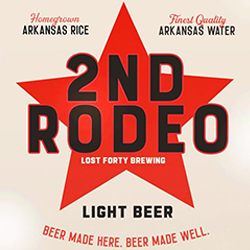 Second Rodeo is a premium light beer brewed with just a few simple ingredients like naturally pure and clean Arkansas water and homegrown Arkansas rice for a light, crisp brew that's low in alcohol and refreshing anytime, anyplace. "Beer Description" content and image are the property of Lost Forty Brewing and are used for informational purposes only.